Yes, I’ve been quiet. The holidays and a slightly changed schedule to my weeks have been crazy. I’ve been enjoying this beautiful thing called sleep. Now that Mike is no longer working night shift (He started a new job last month..yay!!) he and I have been going to bed shortly after putting Alex to bed. After having a big order of cookies over the holidays, I haven’t baked much of anything, except Alex’s birthday cake. I made this cake, but with red buttercream frosting since that was what the birthday girl requested. The holidays, the birthdays and the school break are all over, so now it’s time to hop back into it and start this machine up again. 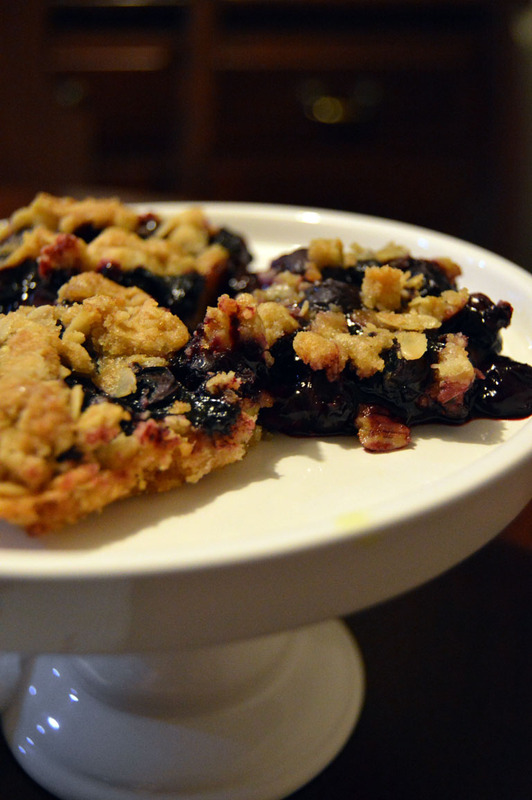 One of my new year’s resolutions is to keep a baking schedule and include recipes I’ve found and tried online and in my books, like these blueberry oatmeal crumble bars, for example. Alex looooooves blueberries. I had to hide them so I could make this recipe! I found it on Pinterest, from Averie Cooks. Slightly altered, I not only used fresh blueberries, but I used freshly squeezed juice from a navel orange instead of a lemon. Besides, I didn’t have one. Averie used frozen blueberries which required her to bake 55 minutes. I only baked for 45, but I also made sure the crumble topping wasn’t getting too brown. This is a great after-dinner dessert, or heck have a bit of it for breakfast! • Preheat oven to 350-degrees. Cover an 8-inch square baking pan with aluminum foil and spray with cooking spray. This allows for easier cleanup at the end! • Melt the margarine in a large microwaveable bowl for 1 minute. • Mix in rest of the crumble topping ingredients until all mixed and lumpy. Scoop a cup of the mixture and set aside. • Take the rest of the crumble mixture and pat it down on the bottom of the baking pan, all the way to the corners. Set aside. • In the same large bowl, combine all the blueberry ingredients and pour into the baking pan. 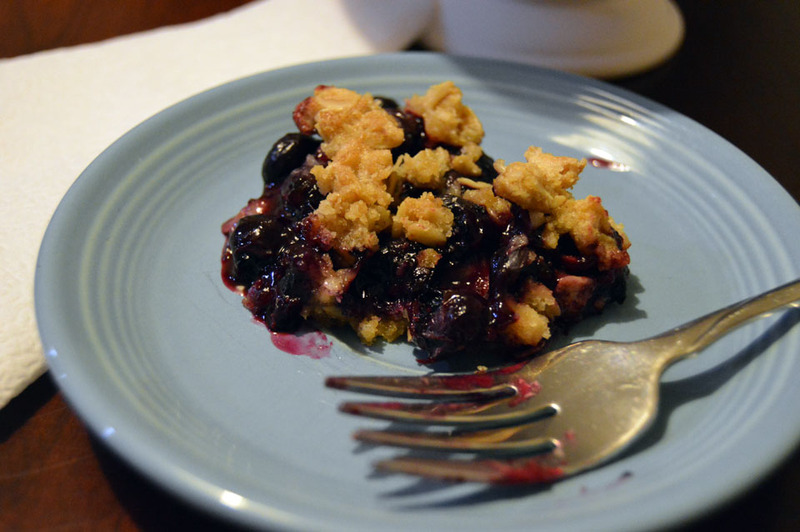 • Take the reserved crumble topping and sprinkle all over the top of the blueberries. • Bake for 55 minutes (if using frozen blueberries) or 45 minutes (using fresh blueberries) until crumble topping is a golden brown color. • Cool completely on a wire rack. Cut into squares. Very nice recipe and I look forward to trying it.